It’s hard, but it’s easy too. 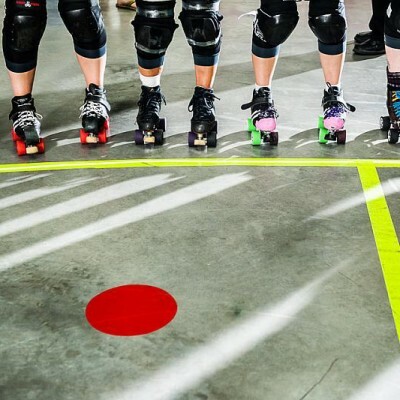 …But the physical roller derby skills are easy, when you know how to solve the ones that stump you. Don’t believe me? I don’t blame you. It sounds too good to be true, like a vacant squat rack at the gym, or a cheap pitch for a clickbait article. Stick with me here though. I’ve coached a lot of skaters at different skill levels. 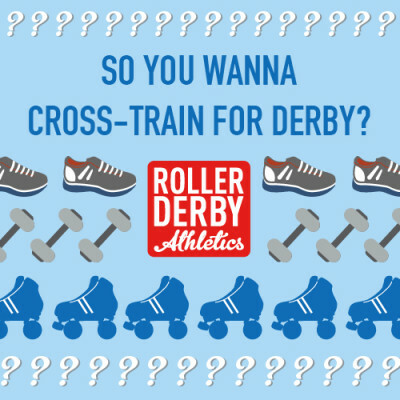 And I’ve seen how asking four simple questions can help 90% of skaters master any roller derby skill that they’re struggling with. (Keep reading for that other 10%). PS: the original image for this post is courtesy of my fave skate shop, Rollergirl.ca! All you gotta do is C.H.E.W. Yup, a cheesy acronym to make it easy to remember. Plus, I like snacks. 1. C is for Core. Is your core engaged? DO I SOUND LIKE A BROKEN RECORD? ‘Cause I feel like one… I say “engage your core!” constantly whenever I coach on-skates or off-skates. If you fail to “make an active connection between your upper body and lower body using your core muscles,” (in short: engage your core) you will have a big ol’ floppy counterweight up top – that would be your head and shoulders – that slows you down, pulls you off balance, and makes you easier to knock down. So try my tricks to activate your transverse abdominis (the core muscles you really want working for you), and get that sh*t engaged while you practice that new skill. JUST HUMOUR ME and I swear you won’t regret it! 2. H is for Head. Where’s your head at? Are you looking at your feet while you try to master this skill? Are they still attached to your legs? Great! You can stop looking at them now. Looking down makes it harder to balance, and also means certain death in actual game play. Don’t feel badly if you do notice your chin drifting toward your chest while you try something new – we all do it. But learn to recognize that this is happening after three or four marginal attempts at a skill, and re-set yourself with your eyes up. All the better to see you with, my dear 200 pound blocker coming my way…! 3. E is for Edges. What edge are you using? Take a close look at someone who’s mastered the skill. Are they on their inside edge or outside? Which direction are their skates pointing when they execute the move? When I’m coaching I often find I can open up a new skill to someone just by pointing out that, for example, her left foot is pointing the wrong direction. Here’s where a quick video taken on the spot with a smartphone can make the world of difference, to identify a quick little fix. 4. W is for Weight. Where’s your weight planted? Are you fearful of transferring your weight 100% to one foot? This is a common pitfall for newer skaters (see: transitions). But a lot of on-skate manoeuvres require a complete shift of your hips and upper body over one leg, to be successful. Even for more expert skaters, if you’re getting mediocre results with a skill – say, an offensive attack from the back of the pack, or a wide juke to fake out a two-wall – maybe you just need to make a bigger weight transfer. Again, some quick smartphone video can help you identify what’s going on with your weight placement. Front to back weight is important too! Is your weight too far in your heels, or too far forward over your toes? A small adjustment here can make a dramatic improvement. Many skaters struggle to get out of side-stance skating. They can get into the stance, and coast for a few feet, but the exit from this position is an awkward, twirling transition and they end up accidentally facing backward. Why? Because their weight is about 70% in their back skate, so they can’t step out and forward out of side stance. It’s kind of like driving up an icy hill with rear wheel drive. If this is you, give it a try: when you get into a side stance, shift your weight further to your front foot – at least 50% if not 60%. Now step forward to get out of the stance. Voila. Placement of weight for the win! Finally, lest someone in roller derby forget to say this for the eleventy-millionth time, well… Get Low. If your weight is lower to the ground, you’ll have an easier time maintaining your balance, developing power into the movement, and just generally having more success! Next time you’re trying something new, or even an old skill you’ve never been very solid at, give yourself the CHEW test – Core, Head, Edges, Weight. 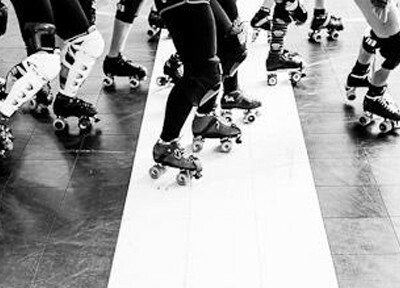 See how quickly you can improve or master that roller derby skill with a few minor adjustments! Even with these adjustments, you still are not guaranteed to nail it on the first try, or even the 50th try. Personal example: I am still pretty awkward and crappy at one-foot transitions, despite a year of practicing them! Still, they’re oceans better than they were, and I use that improvement to motivate me to keep working on them until they’re great. Physical strength and core stability plays a part. If you’re struggling with a full weight transfer, for example, double check that you’re able to perform the skill in slow motion in your socks. Falling over? You might need to work on your hip stability, or your overall core stability. Not yet able to clear the entire apex on your jump attempt? Can you do it in your shoes? If not – keep working on your strength, plyometrics (jumps) and other power training! 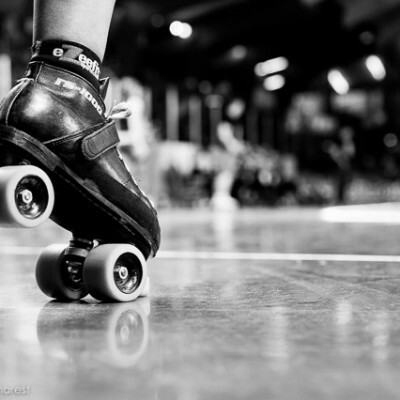 As always having better overall physical fitness – especially core and leg strength – will make almost any roller derby skill come a lot easier. The good news is, I know a lady who has lots of resources to help you with that…! Do you CHEW? What’s your tried and true method to succeed at a new skill? I know you’ve got some good ideas you use to coach yourself or coach others… and I want to hear from you. Help out your fellow skaters, and share your wisdom in the comments area below!